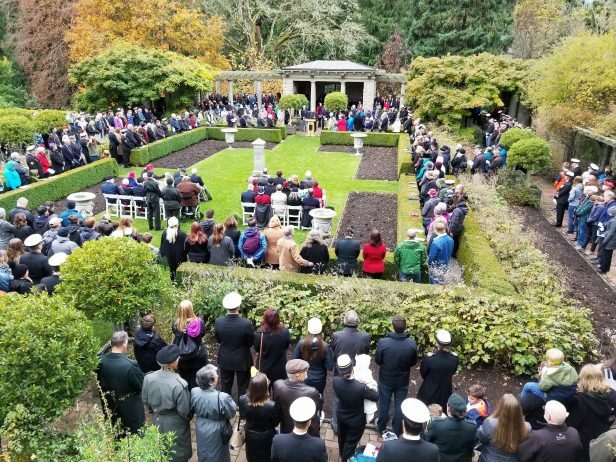 The Vancouver Island Ex-Cadet Club (VIECC) again conducted a Service of Remembrance at Royal Roads as they have done since the closure of RRMC in 1995. 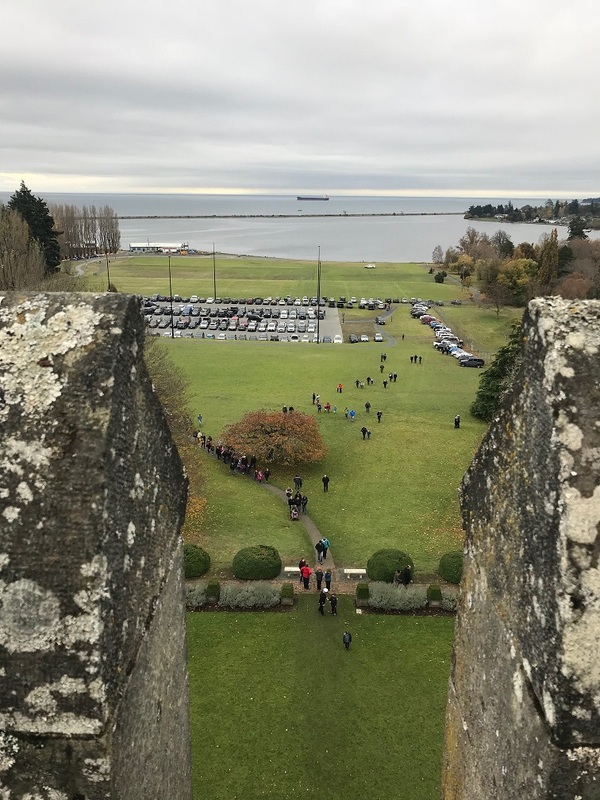 Attendance at the November 11th Service in the Italian Gardens Service has grown significantly as well as the participation and support of Royal Roads University. The Military and Strategic Liaison for RRU was Shelley Langille. This year over 600 persons attended and were welcomed by RRU VP Katharine Harrold whose father is an Ex-cadet of both RRMC and RMC. 8391 Larry Cade, President of the VIECC called the service to order for the singing of “O Canada”. The Service was conducted by Rev. Al Fowler. During his career Padre Fowler served at both RRMC and RMC. 6216 Willy Anderson read from the book of Wisdom 3:1-8. As per the last 7 services a tenor from University Of Victoria sang “Bring Him Home” an aria from ‘Les Mis’. Silver Cross Mother Nancy Mansell and her husband Allan presented a wreath for all Memorial Cross Families and in memory of their son Bombardier Myles Mansell who was killed in Afghanistan in 2006. Eight wreaths were placed including one by 4905 Kent Foster for the Drop Zone Vancouver Island Airborne Community. 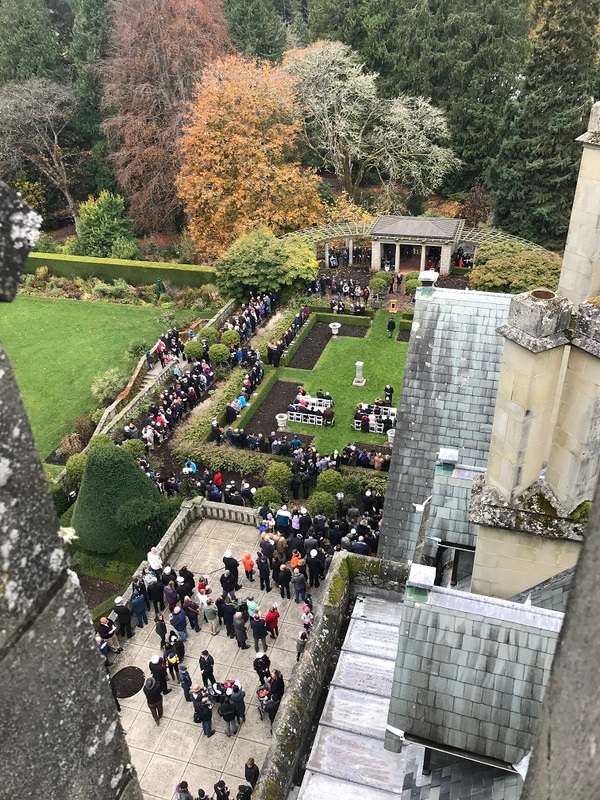 Following the service all attending were invited into the Hatley Castle for coffee and tea and light refreshments. Bravo Zulu to the Vancouver Island branch. Don, that’s a great photo from the turret looking out to the sea. Did you shinny up there before the ceremony?